Do you know more about the RFID epoxy tag? 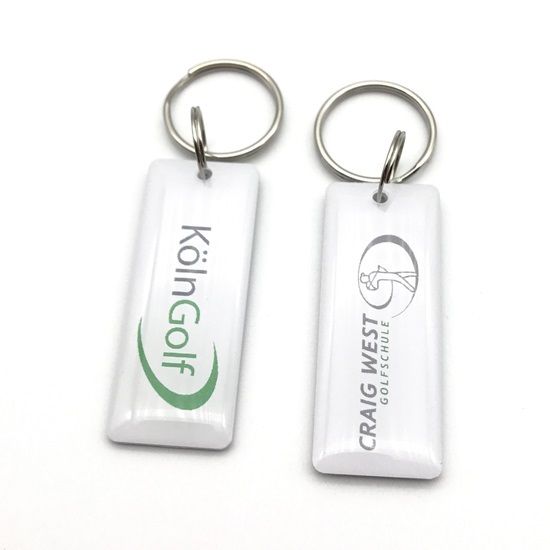 The RFID Epoxy Tag is finely designed to attract the customer’s eyes, the nice appearance is aim to promote company image. It is widely used for loyalty system, access control system, time-attendance system, promotion systems. Epoxy Tag units are resistant to fuels, mineral oils, petroleum and salt mist. They repel moisture – even in high temperature, high pressure washes. Unrelenting performance despite temperature fluctuations allows Epoxy Tag transponders to adapt to demanding applications. These tags can tolerate repeated autoclaving in medical applications, and plastic injection molding processes for permanent embedding into industrial components, equipment or containers. Size Dia.30/32/35mm, 50mm*30mm, 42mm*26mm, 50mm*15mm, etc. Chip Hitag 1/2, Ntag 213/215/216, MIFARE 1K/4K, DESFire, etc. Crafts Adhesive Sheet, Laser Number, Barcode, QR Code, etc. Color Red/Black/Orange/Green/Yellow/Blue/White/Pink/Purple or Any Pantone Color or Multi-Colors or Customized. Applications：Access Control & Security, Loyalty System, Parking Management, Time Attendance, etc. Previous Post How animal tags is becoming so popular? Next Post What technology does the RFID metro token use?